The Wahl Grooming Gear Travel Pack 9962-1617 is ideal for keeping your facial and body hair trim. It contains everything you need to stay looking sharp away from home - and it all comes packed neatly inside a soft-touch storage case. The compact trimmer has precision-edged self-sharpening blades that make it perfect for touch-ups. There is a nasal and detail trimmer that's great for tidying up unwanted hair from your nose, ears and eyebrows - it also rinses clean under running water for quick and easy maintenance. 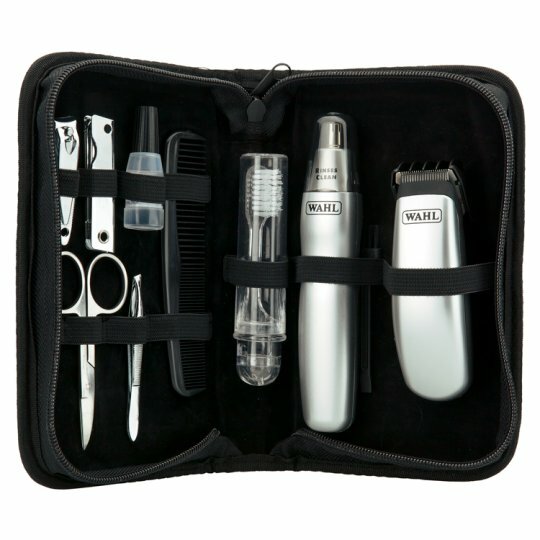 Included in the Wahl Grooming Gear soft storage pouch are nail clippers, scissors, tweezers, file and toothbrush. This kit is the perfect travel accessory and it's compact enough to be placed in a small bag or rucksack. It's fully battery operated so you can stay smart wherever you go, from camping in the wilderness to the top of the ski slope. This handy men's grooming kit is also a great gift idea - now there's no excuse for looking scruffy on your holidays.